Part Six of a series. Read Part Five here. 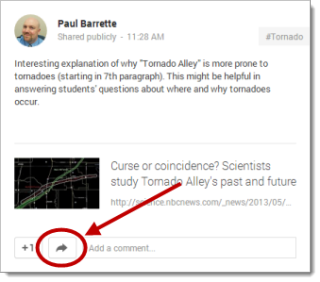 Yet another way to interact with people in your Google+ Professional Learning Community is to "Reshare" posts that appear on your Home page with your Circles. For example, if someone posts a particularly awesome classroom resource, you share the same resource with your own Circles simply by clicking the "Share" button on the original post. When you Reshare a post on Google+, the creator of that post AND the people the post was originally shared with can see that you Reshared it. It won't show who you shared it with, just that it was Reshared. The creator of the post will receive a notification that you Reshared their post.